The quack attack is back! 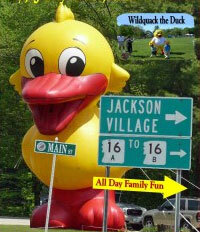 The Annual Wildquack River Festival returns to Jackson Village Park in Jackson, NH. 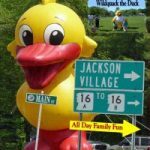 This wildly popular event produced by the Jackson NH Chamber of Commerce attracts a large crowd each year, cheering on their ducks in a race down the Wildcat River for over 100 prizes. More than 3,000 yellow rubber ducks will float, bob and fight their way down the river to the finish line in an exciting and wacky race. This event is always held on the Sunday of Memorial Day weekend. Ask about visiting Jackson or share your WildQuack River Festival reviews. Add your NH Event to NH Living.